Growth along Interstate 25 in Colorado expands the freeway to ten plans plus two auxiliary lanes through Greenwood Springs. Photo taken 08/11/16. Interstate 25 follows the Front Range of the Rocky Mountains joining the capital cities of Santa Fe, Denver and Cheyenne. 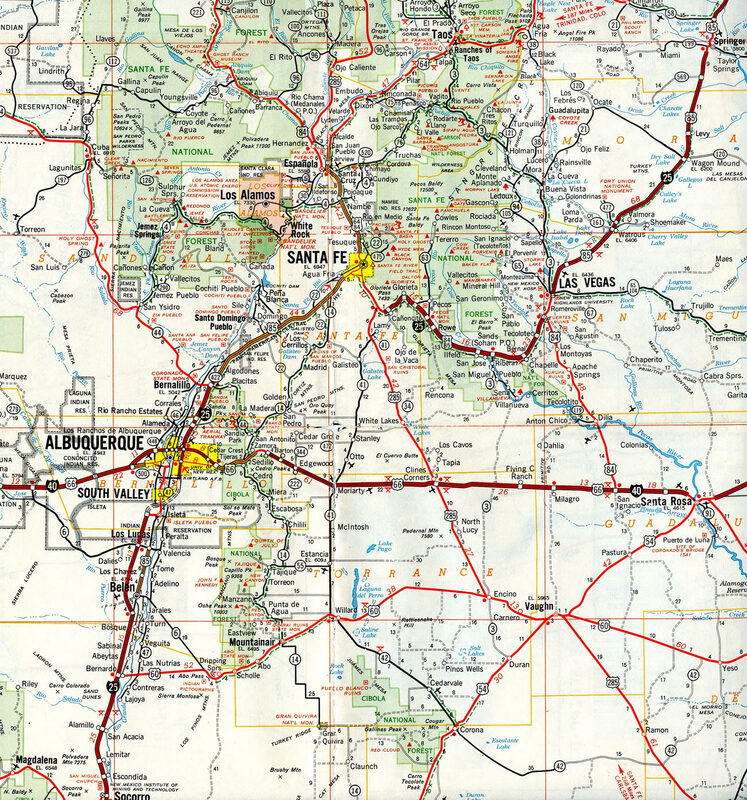 I-25 also serves Albuquerque, New Mexico’s largest city and Pueblo and Colorado Springs in central Colorado. Suburban growth along the corridor may someday join the Denver and Colorado Springs metropolitan areas. HO/T lanes (North I-25 Express Lanes) accompany the freeway from 20th Street at Downtown Denver to Adams County, north of I-270 and south of Thornton. Interstate 25 is part of High Priority Corridor 27: Camino Real for its entire length. Interstate 25 replaced all of U.S. 85 from Las Cruces, New Mexico, north to Denver, Colorado. 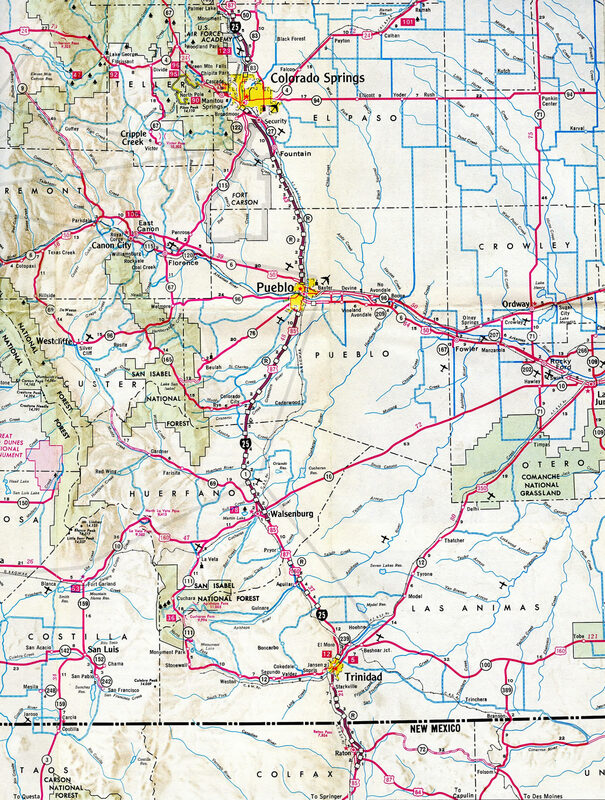 The freeway also replaced U.S. 87 from Raton, New Mexico, northward to its terminus in Buffalo, Wyoming with the exception of a parallel stretch between Glenrock and Casper. U.S. 85 parallels the freeway again in the Cheyenne vicinity. These U.S. routes are generally not co-signed in New Mexico or Colorado, but U.S. 85 and U.S. 87 are well-signed in Wyoming. Other overlaps with U.S. routes in New Mexico include U.S. 60 north from Socorro, U.S. 285 near Santa Fe, U.S. 84 from Santa Fe east to Las Vegas and U.S. 64 at Raton. Within the Centennial state, U.S. 160 accompanies I-25 north from Trinidad to Walsenburg and U.S. 24 overlays I-25 at Colorado Springs. 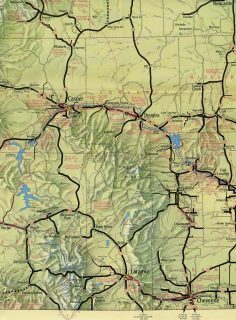 Within Wyoming, U.S. 26 runs in tandem with I-25 west from Dwyer to Glenrock while U.S. 20 ties in from Orin to Glenrock. A $270 million investment in the form of interchange reconstruction culminated in 2002 with the completion of the “Big I” construction project. This 24-month road work commenced July 2000 with the rebuilding of Interstate 25 ramps and overpasses in and around the junction with Interstate 40. This involved the replacement of left-hand entrance and off-ramps with new high-speed flyovers. In addition nearby frontage roads expand to two lanes and continue through the Big I area to improve traffic flow. For a history of the completion of Interstate 25 in Colorado, visit Interstate 25 @ AARoads. 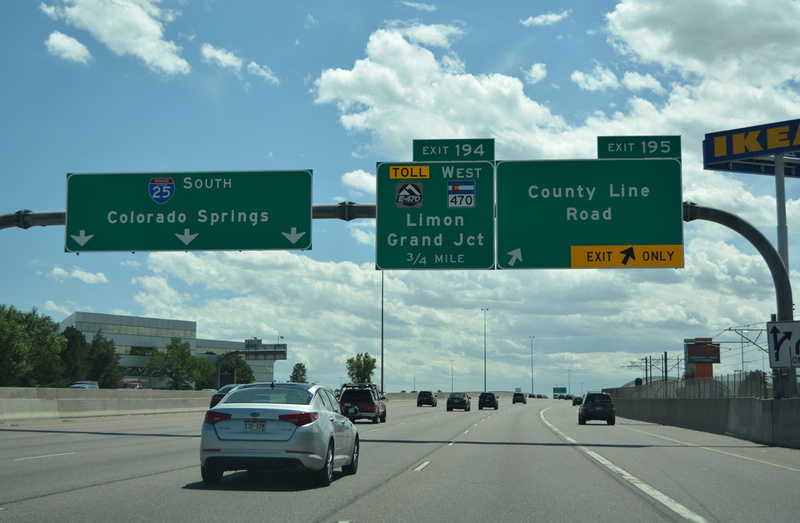 Interstate 25 was also improved through the Colorado Springs area. As of March 2006, the Holland Park Noise Barrier and bridges over Ellston Street were completed. Projects continued to include widening and modernization of the freeway at the Bijou Interchange/Colorado Avenue, from Fillmore Street to Garden of the Gods, the section near North Nevada Avenue (Business Loop I-25) and Rockrimmon, and from Woodmen to North Academy. Completion of Colorado Springs Metropolitan Interstate Expansion (COSMIX) occurred by December 2007. The largest multi-modal transportation project in Colorado history, T-Rex, started in September 2001. With origins dating back to 1944, the predecessor of Interstate 25 was the Platte Valley Drive Road. The $33 million project broke ground on November 16, 1948 and encompassed 11.2 miles. The road became known as the Valley Highway. Between Evans Avenue and 52nd Avenue, the freeway opened on November 23, 1958. Traffic counts topped at 33,000 vpd. By 1964, construction commenced for Interstate 225 with a design capacity of 50,000 vpd. This freeway opened fully between Interstate 70 and Interstate 25 on July 21, 1976. Both facilities were well over capacity with the Valley Highway at 230,000 vpd and Interstate 225 at 120,000 vpd in 1998. Traffic volumes were consistent in both directions of travel. This was based upon the fact that Denver has two major employment hubs: the Central Business District to the north and the Southeast Business District to the south. These factors set the tone for the T-REX construction project. 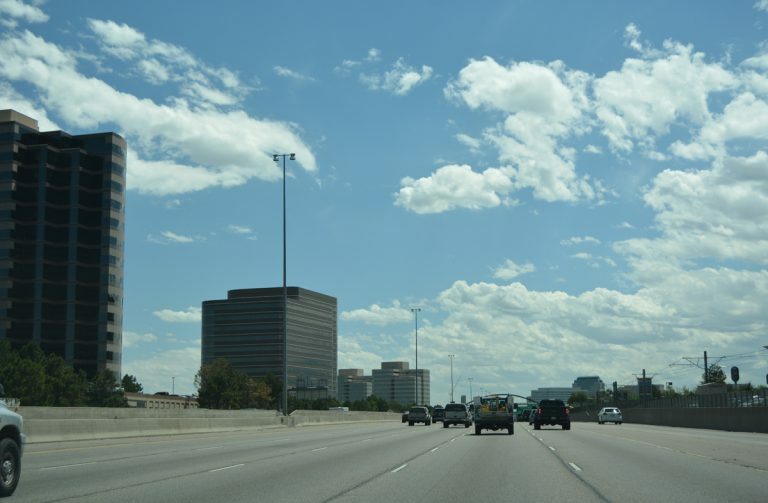 Interstate 25 was expanded to four lanes per direction between Logan Street and Interstate 225. 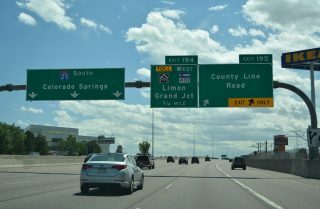 Two lanes in each direction were also added to Interstate 25 from Interstate 225 to the Colorado 470/E-470 junction, bringing this portion of highway to ten overall lanes of width. Interstate 225 saw expansion to six overall lanes between Interstate 25 and Park Road at Aurora. Eight interchanges were reconstructed, including the southern terminal of Interstate 225. The highway aspect of the project entailed $795 of the overall $1.67-billion project. To mitigate time concerns, a design-build scheme was implemented to the overall project. This allowed construction and design to take place simultaneously. Due to increasing development and rise in traffic volumes, expansion of Interstate 25 was slated to occur along a 40-mile stretch north of the capital city. 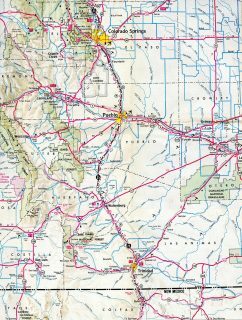 The $370 project was broken into four phases, the first of which incurred the southernmost seven miles of the project area, covering the alignment between Colorado 7 and 52. This $73 million segment involved safety and capacity improvements. Construction ran between November 2001 and early 2005. Included in Phase One was an expansion of Interstate 25 from four to six lanes, reconstruction of the Weld County 8 interchange and removal of a railroad overpass to the north. The overall scheme allows for the addition of HOV lanes. For a history of the completion of Interstate 25 in Wyoming, visit Interstate 25 @ AARoads. Interstate 25 through north central New Mexico – 1972. Through traffic along Interstate 25 between Albuquerque and Santa Fe utilized a multi-lane divided stretch of U.S. 85. Completion of the freeway in New Mexico in 1980 led to the removal of all signs for U.S. 85 in the Land of Enchantment. 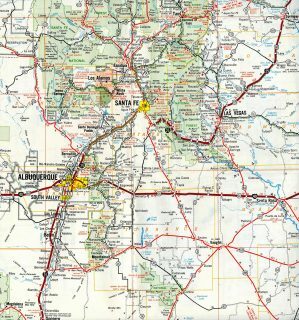 All of Interstate 25 was complete from Walsenburg north to Wyoming by 1968. 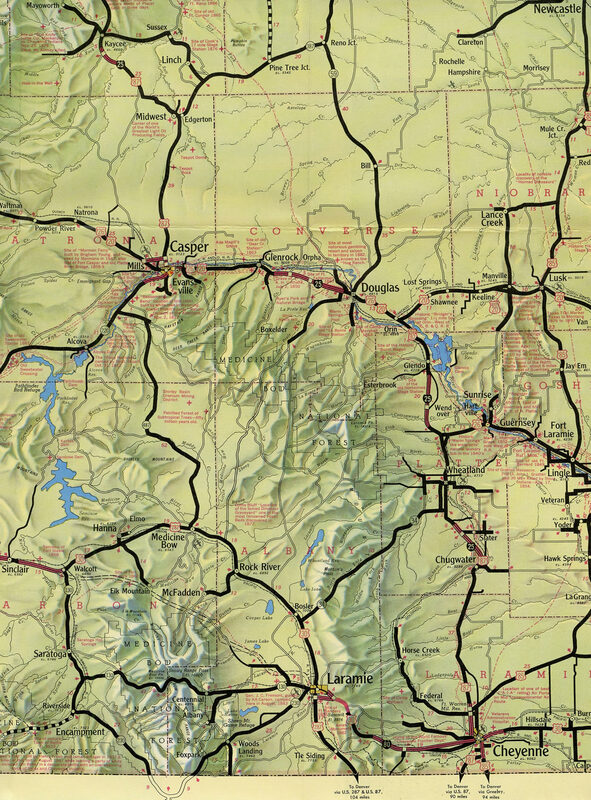 This excerpt was taken from the 1968 Colorado Official Highway Map. The final section of I-25 to open in Colorado was a 21 mile segment between Trinidad and Walsenburg. It was dedicated on September 21, 1969. Approaching the E-470 toll road and C-470 on Interstate 25 south at Lone Tree, Colorado. E-470 provides an eastern bypass for Interstate 25 around the Denver metropolitan area. The 47 mile long beltway uses all electronic tolling (AET). Photo taken 08/11/16. An end shield for Interstate 25 north stands just east of Johnson County Fairgrounds and ahead of the directional T interchange (Exit 300) with Interstate 90. Photo taken by Dale Sanderson (03/01). Single lane ramps partition traffic for the continuation of U.S. 87 north onto I-90 west to Billings, Montana and I-90 east to Gillette, Moorcroft and Rapid City, South Dakota. Photo taken by Dale Sanderson (03/01). Interstate 90 & U.S. 87 angle southeast across a broad valley fed by Rock Creek on the approach to Buffalo and Interstate 25 south. Photo taken 08/07/16. Business loops for both I-25 south and I-90 east branch southward from Interstate 90 to accompany U.S. 87 Business along Main Street to U.S. 16 in Buffalo. I-25 bypasses the city center to the east. Photo taken 08/07/16. U.S. 87 splits with I-90 east at the directional T interchange (Exit 56B) for Interstate 25 south. The two overlap to Casper. Photo taken 08/07/16. Interstate 90 curves northwest from Business Loop I-90 and U.S. 16 to next meet the north end of Interstate 25 (Exit 56B). Photo taken 08/07/16. A left-hand ramp takes motorists onto Interstate 25 & U.S. 87 south. U.S. 87 north commingles with the Interstate 90 corridor north to Sheridan and Billings, Montana. Photo taken 08/07/16. Traffic separates from I-90 west for Interstate 25 & U.S. 87 south to nearby Buffalo, Casper and Cheyenne. Business Loop I-90 west returns to I-90 at an adjacent half diamond interchange (Exit 56A on I-90 east). Photo taken 08/07/16. Traffic separates at the south end of Interstate 25 for I-10 east toward El Paso and west to Deming, Lordsburg, and the state of Arizona. Photo taken by Jeff Royston (05/27/04). A flyover ramp (Exit 144) loops north from Interstate 10 east onto I-25 north through Las Cruces as I-10 & U.S. 180 turn southward toward El Paso. This high speed ramp replaced a tight loop ramp located further souther. Photo taken by Jeff Royston (05/29/04). Interstate 10, U.S. 85 and U.S. 180 leave an agricultural area across Fillmore Arroyo just ahead of the three-wye interchange (Exit 144) with Interstate 25 north. Photo taken by Jeff Royston (12/00). Interstate 10 & U.S. 180 turn westward across south Las Cruces, overtaking U.S. 70 en route to Deming. I-25 lines the U.S. 85 corridor northward along the Rio Grande toward Truth or Consequences, Socorro and Albuquerque. Photo taken by Travis Zeal (08/00). The North Forty Project. CDOT. Big I Project Information http://www.thebigi.com/. New Mexico State Highway & Transportation Department. U.S. and Interstate Highways in New Mexico (Steve Riner). Page updated April 13, 2017.